We recently assessed a beautifully bound album that required a little TLC and needed wrapping in archival manila, a basic archival task which we carry out on a regular basis. This tome has embossed in fine gold lettering on the cover, ‘NEWSPAPER CUTTINGS’, and this particular album belonged to Professor Percy Edward Newberry [PEN] (1868-1949), whose working papers are housed in the Griffith Institute Archive. Newberry’s papers have all sorts of goodies tucked away within them … material relating to PEN’s excavation work in Egypt when he was the Field Director of the Archaeological Survey Expedition for the Egypt Exploration Fund (now the Egypt Exploration Society), and numerous records for his many interests including the botany of Egypt – ancient and modern. Newberry was the expert brought in to record the botanical material found during the excavation of the tomb of Tutankhamun, another member of the excavation team was PEN’s wife Essie who worked on the textiles from the tomb. Percy Newberry and Howard Carter were close colleagues and friends; it was Newberry who gave the man who would later discover the tomb of Tutankhamun, his first opportunity to work in Egypt. 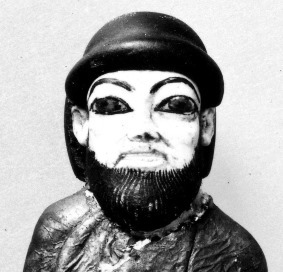 He hired Carter as a junior draughtsman to the EEF’s expedition recording scenes in Middle Kingdom tombs at Beni Hasan and Deir el-Bersha in 1892-3. The gem of the Newberry collection has to be his correspondence, which without doubt is one of the most consulted holdings in our Archive. This textual time-capsule contains an incomparable wealth of Egyptological information, as well as a fascinating glimpse into Newberry’s social life! Newberry does not appear to have ever thrown anything away so his papers are a mine of information, which on the one-hand is invaluable but on the other quite challenging to curate! Newberry had a reputation for squirreling away everything, from drafts for articles to postage-stamp sized pieces of papers with tiny handwritten notes, which no doubt were very significant to him but often leaves us at a loss to reinterpret. In fact his colleague and friend, the great philologist Sir Alan H. Gardiner, makes reference to the value of all these records in an obituary for Newberry: ‘his collections of notes were stupendous and he was always ready to help others out of the vast store of information he had at his command‘ . 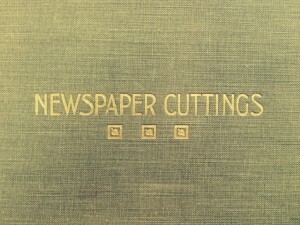 Detail of the cover of Percy Newberry’s ‘Newspaper Cuttings’ album. This leads us to imagine that Gardiner, or perhaps poor Essie frustrated by her husband’s ever-expanding hoard of paper, presented Newberry with this newspaper cuttings album in order to gently nudge him into introducing some small area of organisation within his sea of documents with the hope it would encourage him to wrestle the rest into some sort of sensible arrangement! Such an album is mainly a paper relic of yesteryear, the collecting of themed or alternatively, eclectic groups of newspaper articles and images, which were then carefully pasted into albums specifically manufactured for the purpose, this is a somewhat different pastime from the more modern sanitized form of “scrapbooking”. 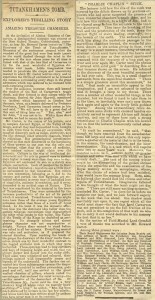 On page 59 of Newberry’s cuttings album, is an article from the Daily Telegraph dated 22 September 1923. 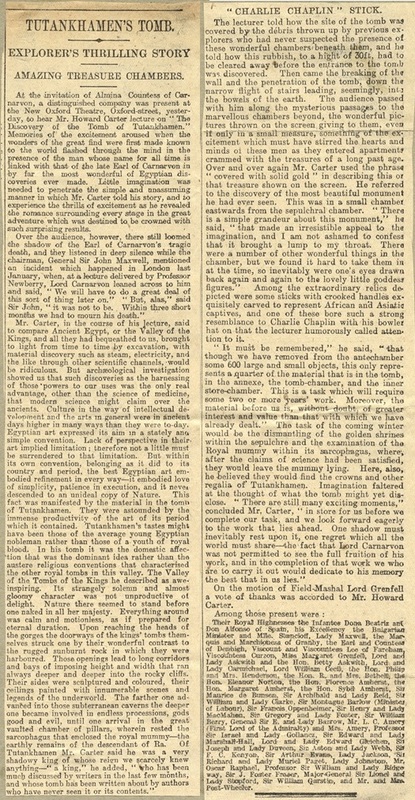 It reports on one of the first public lectures delivered by Howard Carter on the discovery of the tomb of Tutankhamun in November 1922. What piqued our interest was one of the article’s paragraph headings: ‘“Charlie Chaplin” Stick‘, though to appreciate this reference you may need to be over a certain age?! The reporter writes about the lantern-slide images that Carter used to illustrate his talks : ‘Among the extraordinary relics depicted were some sticks with crooked handles exquisitely carved to represent African and Asiatic captives, and one of these bore such a strong resemblance to Charlie Chaplin with his bowler hat on that the lecturer humorously called attention to it‘ . 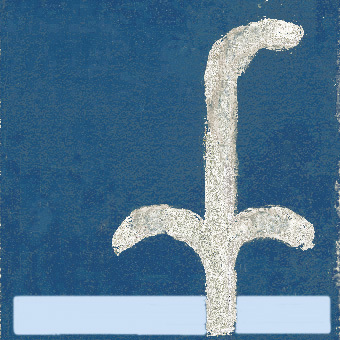 The stick Carter was referring to was one of a group which depicted foreign captives. The bodies of the captives are skilfully carved and cleverly shaped into an elegant curve in order to form the stick-handle, but this is not just a beautiful demonstration of the carpenter’s art, this feature would symbolically enable Tutankhamun to firmly take hold of his troublesome neighbours and demonstrate his dominance over them, literally keeping Egypt’s enemies well and truly under his thumb! The object assigned the Tutankhamun tomb excavation number (48d) appears to be the stick remarked upon, its handle is decorated with two captives, one Nubian and one Asiatic bound back-to-back, tied by their arms. The Asiatic prisoner does indeed appear to be wearing a Chaplin-like bowler hat, but we do not recall any of the characters played by the great silent-movie star having a full-beard and moustache, including Chaplin’s most famous creation, ‘The Tramp’ whose toothbrush moustache made him instantly recognisable to the movie-going public. Over 130 sticks of various shapes, sizes and designs were found in Tutankhamun’s tomb. 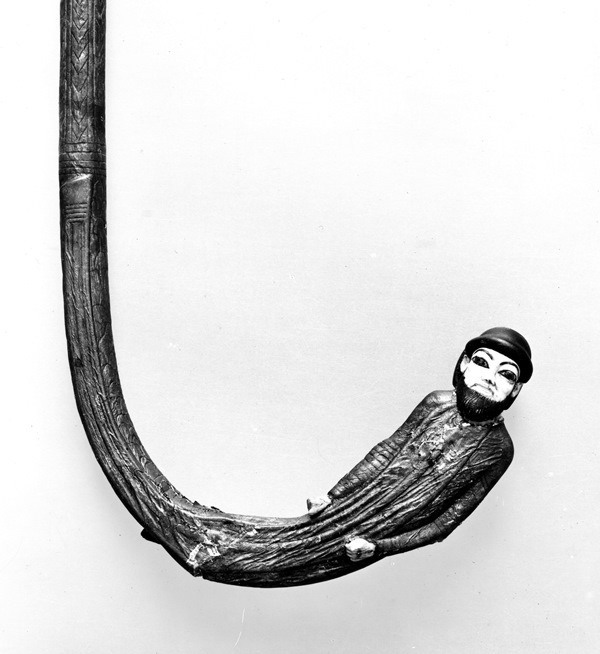 The stick or staff was a symbol of power and status throughout the Pharaonic period, as it was and still is in many civilisations and cultures, so it should be no surprise that a pharaoh would be buried with many such items. It is also been argued by some researchers that Tutankhamun had a physical disability and the presence of so many sticks is evidence that the King relied on them for mobility. There are currently plans to study and publish this particular group of material from Tutankhamun’s tomb and it will be interesting to see what the conclusions are on this aspect. Obituary, Prof. P. E. Newberry, The Times, 17 August 1949, page 7. The Carter lantern slides in their original wooden cabinet now form part of the Tutankhamun Archive kept at the Griffith Institute, and is included in one of the displays in the ‘Discovering Tutankhamun’ exhibition in the Ashmolean Museum in 2014. Daily Telegraph, 22 September 1923.